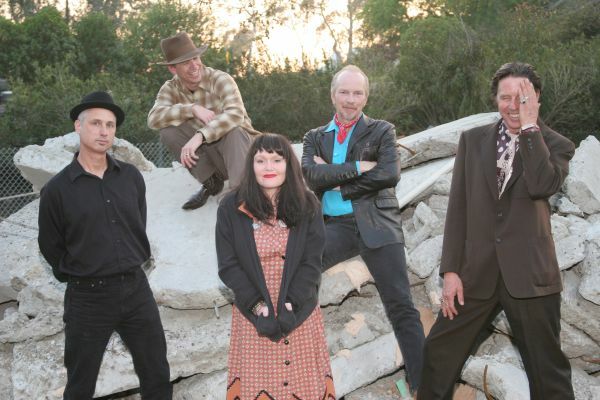 The Knitters – Doe, co-lead vocalist Exene Cervenka, guitarist Dave Alvin, bassist Jonny Ray Bartel, and drummer D.J. Bonebrake – have been rambling a tangled map of American musical highways since way back in the 20th century. Now, with their first album in 20 years, The Modern Sounds of the Knitters, the revered American band is bringing their traditional sound to a new generation of listeners. In fact, the Knitters are no strangers to the controversy over “electrified” folk music. Some writers bemoaned the fact that the members of the legendary band put their careers on the back burner to undertake an unlikely experiment with punk rock: Exene, Doe, and Bonebrake continue to perform with their well-received side project X; Alvin followed his work in the Blasters with a solo career; and Bartel played bass with the blues-rock band the Red Devils. The latter album, released by Slash Records in 1985 – which featured folk-styled versions of the Knitters’ punk music, as well as new renditions of songs like the famed title track, which they first recorded for Victor Records in 1932 – brought their original style to a new generation of listeners reared on the punk rock of the day. The new album also includes “The New Call of the Wreckin’ Ball,” a sequel to a song re-cut for Poor Little Critter in the Road (and originally heard on Backwoods Ballads and Front Porch Songs, the 1959 Capitol LP that gave the Kingston Trio a run for their money and became the Knitters’ biggest hit of the “folk revival” era). Some of the material – Flatt & Scrugg’s “Give Me Flowers While I’m Living” and the Stanley Brothers’ “Rank Stranger” – dates back to the late ’40s and early ’50s, when the Knitters made their brief, much-talked-about transition from a hillbilly string band to the new bluegrass sound.